​You Deserve to Be Happy - ​By Brian Tracy - Something New Everyday! Achieving your own happiness is the best measure of how well you are living your life and enjoying your relationships. You can learn how to be happier and more fulfilled in everything you do. smorgasbord and come back with plates that looked completely different. Happiness is the same way. 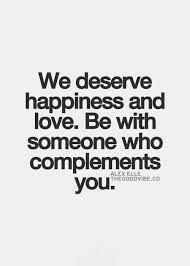 Each person requires a particular combination of those ingredients to feel the very best about himself or herself. You're true to yourself only when you follow your inner light, when you listen to what Ralph Waldo Emerson called the "still, small voice within." You're being the very best person you can be only when you have the courage and the fortitude to allow your definition of happiness, whatever it may be, to be the guiding light of every part of your life. A very important point on the subject of happiness is whether or not you feel that you "deserve" to be happy. Accept the notion that you deserve all the happiness you can honestly attain through the application of your talents and abilities. The more you like and respect yourself, the more deserving you will feel of the good things in life. And the more deserving you feel, the more likely you will attain and hold on to the happiness you are working toward. You should make happiness the organizing principle of your life. Compare every possible action and decision you make against your standard of happiness to see whether that action would make you happier or unhappier. Soon, you will discover that almost all of the problems in your life come from choices that you have made - or are currently making - that do not contribute to your happiness. Of course, there are countless times when you will have to do little things that don't make you happy along the way toward those larger things that make you very happy indeed. We call this paying the price of success in advance. You must pay your dues. Sometimes these interim steps don't make you happy directly, but the happiness you achieve from attaining your goal will be so great that it totally overwhelms the temporary inconveniences and dissatisfactions you have to endure in order to get there. First, accept that you deserve all the joy and happiness you can possibly achieve through your own efforts. Second, make your own happiness the chief organizing principle of your life and judge everything against that standard.